Tulsa's iconic Rose Bowl bowling alley has been closed for almost three years now. The parabolas of concrete have been the victim of arson, vandals and a non-compete clause that won't allow anyone to open a bowling alley on the site. But the current owner, Sam Baker, claims the structure is sound. Rumors of a Route 66 museum have been tossed around for some time. So far the only progress has been a much-needed coat of paint. 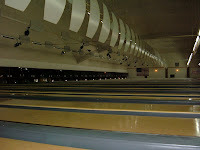 When it was announced the Googie-esque lanes were to close I rushed over with camera in hand. These pictures are from March 2005 and give you some idea just how hideous the paint scheme looked at that time. I'm happy to report it's pink again. 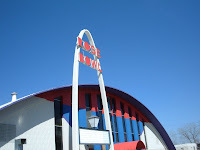 The Rose Bowl opened in 1962 and was designed by modernist architect Bill Ryan. He also designed the oft-maligned East Central High School and the Lutheran church that overlooks the Broken Arrow Expressway like a huge concrete chicken.